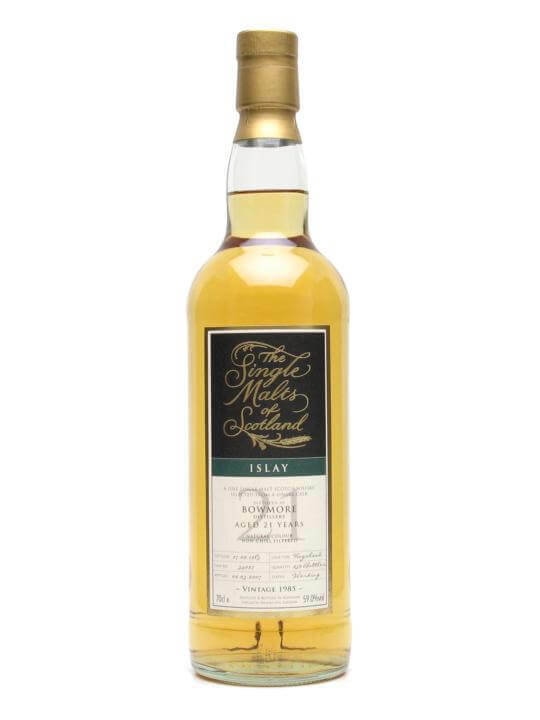 From a distillery owned by the company that brought us the McClellands malts from last week, this a single cask offering from the former "Sherriff's" Bowmore distillery. Bottled by the folks at Speciality Drinks (who were nominated for a Drammie... no, not THESE Drammys), the Single Malts of Scotland have limited availability but are loved by most who are able to taste their wares. From odd to awesome, good single cask bottlings are things to be cherished and enjoyed. Hey, it's almost March. Time to start looking into booking and planning for Feis Isle 2008? All Single Malts of Scotland bottlings had on the mission can be seen HERE. For Bowmore distillery info and all Bowores had on the mission, click HERE. Grainy and outdoorsy, organic. Horse stables. High abv is gentle, comes off as bakery sweetness, vanilla cakes. Smoked ham, Mr. Clean, and apple juice. Ashes, soot, dry manure in a damp horse paddock. More pork, pancetta, and chewing the leather straps of new baseball glove. An odd chocolate mint kind of flavour comes out after some time and the finish is chewy, sweet, smoky, and oaky. Does not go quietly into the night. Blind, one would be hard pressed to guess the age and the odd mix of flavours would have even the keenest nose struggling to pinpoint the source distillery. But it works, and takes water well. Water exposes smoke, burnt bits of pastry, and wet hay. A charming oddy.